Headaches can be caused by many different reasons, like allergies, cold and flu, hormones, stress, and tension, but they can share identical symptoms. This recipe focuses solely on soothing the discomfort so we can feel better. If your Roll-On for Headaches Essential Oil Synergy isn’t created yet: Combine all essential oil drops together in your synergy bottle, pop in the orifice reducer, and then gently shake to combine the essential oils. We have found that the synergies are most aromatic when they are given time to rest and marinate, anywhere from 2 to 24 hours, before they are used in a beauty product recipe. 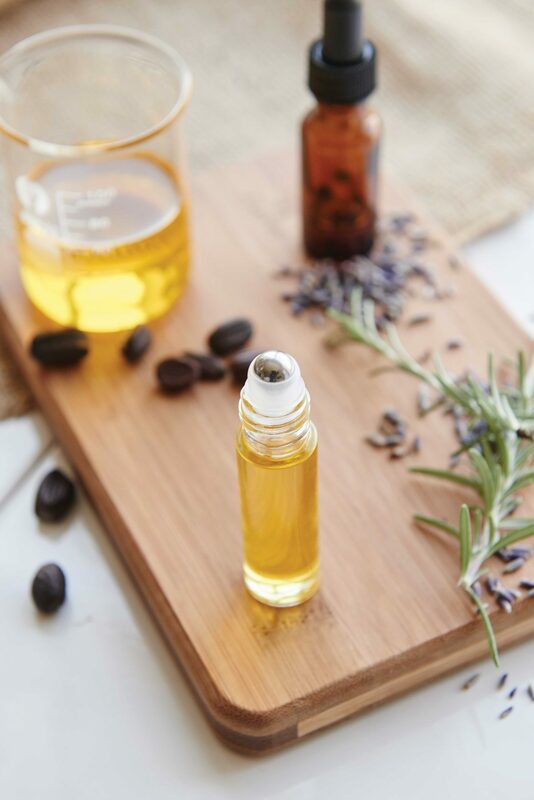 To make your Roll-On: In a glass measuring pitcher, combine the jojoba oil and synergy, mixing well. Carefully pour the mixture into the narrow opening of the roll-on bottle. Snap the roller ball into place, cap the bottle, and shake. The roll-on should last for 6 months. How to Use the Roll-On: Gently roll the oil blend on your temples, the back of your neck, and your scalp. Use as often as needed when symptoms arise.